Sandblasting may seem like a relatively modern creation but, believe it or not, it was invented nearly 150 years ago! Benjamin Chew Tilghman, the inventor of sandblasting saw the scouring effects of windblown sand while serving in the Civil War. Sandblasting has deep roots and continues to be an important commercial and industrial process with a wide variety of usages. As a commercial general contractor serving the greater Philadelphia area, AW Painting & General Contractors are very familiar with the process of sandblasting and we thought we’d share the basics with you. Each blasting material works well for certain applications and not as well for others. Sandblasting professionals are intimately aware of the hardness, sharpness and abrasive properties of every material available and are able to choose just the right material to give customers optimal results. 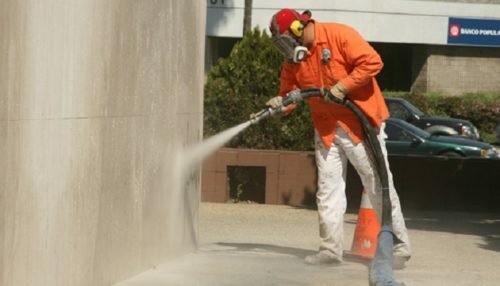 Concrete surfaces are a perfect candidate for sandblasting. The abrasive particles blast away dirt, grime, oils, and other industrial pollutants, without wasting a drop of water. Factory walls, concrete exteriors, and walkways of all stripes can benefit from an occasional sandblast cleaning. Sandblasting is great for cleaning large pieces of industrial machinery, removing layers of rust, grime, old paint, grease, and other pollutants, but it’s equally good at cleaning smaller tools. Many of these tools are difficult or impossible to clean with soap and water, but sandblasting scours them to a perfect shine. Certain industrial coatings require a nearly perfectly clean surface to adhere properly, a clean not achievable by any other method but sandblasting. This is because sandblasting removes every bit of grime from a given surface without leaving anything behind. Not only does it produce an immaculate clean it can also introduce a fine texture into the surface that helps coatings adhere. Sandblasting is essential to this process. Mold contamination is a big problem in the rental real estate market and in certain commercial ventures. Sandblasting can be used to remediate this generally, and in difficult to reach places like crawl spaces and attics. After a sandblasting treatment, you won’t be able to find a speck of mold clinging anywhere. Mold remediation is one of the applications that use specialized abrasives, generally relying on baking soda and dry ice. How can you take advantage of these sandblasting applications for your business? By calling us! We here at AW Painting & General Contractors have been offering sandblasting services to the greater Philadelphia region and surrounding areas for over 40 years. Give us a call and let our friendly employees set you up with an appointment and/or estimate today!